* L-R: Mrs. Boma Ukwunna, Executive Director, Cargo Services and Operations, Skyway Aviation Handling Company PLC (SAHCO);Mr Olaniyi Adigun, Executive Director, Sales and Marketing (SAHCO), Mr Basil Agboarumi, Managing Director/CEO,SAHCO,Capt. Roy Ilegbodu, Managing Director, Arik Air;Mr Ayodeji Ilesanmi, Chief Finance Officer, Arik Air, Mr Murat Ozkan, Vice President, Operations and Customer Services, Arik Air. The Skyway Aviation Handling Company (SAHCO)PLC said it has renewed its ground handling contract with Arik Air. Speaking at the renewal of the ground handling service agreement with Arik Air at the Murtala Muhammed Airport (MMA), Lagos, the Managing Director/CEO, SAHCO PLC, Mr. Basil Agboarumi, promised to deliver quality and improved ground handling services to all its clientele across the nation’s airports especially as it acquires more state-of-the-art equipment for operations. Agboarumi disclosed that some new ground handling equipment of the company would in the next few weeks arrive the country, adding that this would further improve the quality of its service to its clients, including Arik Air. According to him, since the company was acquired by Sifax Group of Companies about nine years ago, the board had strived to improve the quality of services to its clients, stressing it would continue to grow its services especially as the company is enlisted on the Nigerian Stock Exchange (NSE). 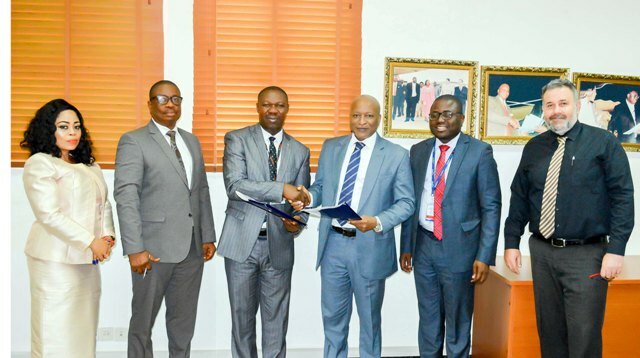 On the renewed agreement with Arik Air, Agboarumi emphasised that it portends endorsement and credibility on the services of the ground handling company. The agreement was renewed for another three years. He continued, “We have warehouses in Port Harcourt, Kano, Lagos and Abuja and we are ready to build warehouses wherever they are needed. You have to understand that we are business people. If there is need for business expansion to any airport in the country, we will not hesitate to do that. Not just in Enugu, but across Nigeria. As long as business is expanding to those sides, you will see SAHCO there. On his part, the Vice President, Ground Operations, Arik Air, Mr. Murat Ozcan, expressed excitement with the renewed agreement with the ground handling company. Ozcan also said that the airline had in the last five years developed a mutual relationship with SAHCO. He explained that the renewed agreement would run for three years, adding that the management would be willing to constantly renew its contracts with the ground handling company. He posited that equipment of SAHCO had improved over the years and urged the management to constantly invest in state-of-the-art equipment. “We have a very long standing relationship with SAHCO and they have always been there for Arik Airlines. For the past five years, we have had a very great experience with them and I am happy to say that we have signed for another three years for SAHCO to provide ground handling assistance for our networks. It is a very happy day for us and we will be looking forward to work with them for the next three years as well as many more years to come,” Ozcan said. SAHCO is an aviation ground handling company, offering services in Passenger Handling, Ramp Handling, Cargo Handling and Warehousing, Aviation Security, Baggage Reconciliation, Crew Bus and Executive Lounge Services and other related Ground Handling Services. Be the first to comment on "SAHCO PLC Renews Ground Handling Deal With Arik Air"